We’d love your help. Let us know what’s wrong with this preview of Press Here by Hervé Tullet. PRESS HERE , MIX IT UP!, LET'S PLAY!, and SAY ZOOP! Collect all four interactive books from Hervé Tullet! Press the yellow dot on the cover of this interactive children's book, follow the instructions within, and embark upon a magical journey! Each page of this surprising touch book instructs the reader to push the button, shake it up, tilt the book, and who knows what wil PRESS HERE , MIX IT UP!, LET'S PLAY!, and SAY ZOOP! Collect all four interactive books from Hervé Tullet! To ask other readers questions about Press Here, please sign up. When we talk about interactive picture books we’re usually talking about pop-up books or tactile books with fuzzy/bumpy details. When we talk about picture books that break down the fourth wall, we’re usually talking about titles that approach the reader directly with a narrative like The Monster at the End of This Book or Don’t Let the Pigeon Drive the Bus or Can You Make a Scary Face So where do we slot the little French import Press Here by Herve Tullet? Interactive but also reliant on the pa When we talk about interactive picture books we’re usually talking about pop-up books or tactile books with fuzzy/bumpy details. When we talk about picture books that break down the fourth wall, we’re usually talking about titles that approach the reader directly with a narrative like The Monster at the End of This Book or Don’t Let the Pigeon Drive the Bus or Can You Make a Scary Face So where do we slot the little French import Press Here by Herve Tullet? Interactive but also reliant on the paper format, this here’s an entirely new breed of book. One that has its finger firmly on the pulse of what kids are used to, while at the same time finding a way to both upset and exceed their expectations. You know what kids love? Being told what to do. Seriously, it’s a thrill for them. Take Press Here. From the title onward children are given specific directions like “press the yellow dot again” and “try shaking the book”. For every action the child takes, the book seems to respond with the turn of a page. Dots flit and fly in all directions. Sometimes child readers turn out the lights. Other times the dots grow huge on the page with every clap of the reader. By the time you’ve reached the end all the book has to say is, “want to do it all over again?” and you can bet that every reader in the room, tall or small, will scream out an appreciative “YES!! !” in response. I wonder . . . is this the first picture book of the picture book app age? Could you have published a book quite this specific ten or twenty years ago? Does Press Here (called just Un Livre in its native France) in fact mark the start of a whole new genre of children’s fiction? Which is to say, fiction for children that are familiar with interaction and, indeed, demand it. I say that in full knowledge of the fact that only a certain privileged segment of the current youthful population has the opportunity to play with interactive electronic toys. Still, I’ve enough faith in both the small techies and their non-electronic kin to believe that if you tell them to rub a circle in this book, they’ll still have the wherewithal to know to turn the page afterwards. I think. I’ve heard people say that while an eBook or an app of a book may be amusing, it doesn’t have the smell of a book. Smell is important, I’ll grant, but I’ve sniffed enough picture books with nasty rotting cheapo glue in their spines to know that not being able to get an olfactory whiff of a title is sometimes a blessing in disguise. No, the real advantage any given book has over its electronic counterpart is the tactile experience. With screens all you’ll ever feel will be a slick, smooth surface. Books (ironically once deplored by the gatekeepers of children’s literature if they ever included interactive parts) have the distinct advantage of getting to be furry, fuzzy, softy, plushy, or downright chewable from the start. Normally such tactile books are relegated to babies. Yet every book is, in its way, a physical experience. Take Press Here. First off you’ve got these thick cardboard covers, clearly built to withstand some serious blows and shakes. Then you’ve the pages inside, which are shiny and thick enough to give you the impression that you’re really accomplishing something when you turn the page. And that, right there, is yet another advantage over the electronic form. While on a screen you can turn a "page" with a mere flick of your index finger, here kids get to revel the pleasure of lifting the thick luscious pages themselves. It’s a magic trick that never stops giving. The page has now become the lifting of a curtain on the world’s most basic stage. As a children’s librarian I had to consider the readaloud potential of this book. Sure, it’s beautiful for one-on-one experiences. It would even work well with kids who’ve enough experience reading that they know what it’s saying at any given moment. But what about for storytimes with big groups of kids? Since the book is constantly telling “you” what “you” should do next, the reader would have to read the text and then do the instructions themselves. That could be fun, but if I know anything about toddlers and preschoolers, you know that you had better have some pretty long arms if you’re going read this aloud to them. Otherwise you might find them approaching you like small determined zombies, arms outstretched so that they might press and touch and rub and tap the book for themselves. At least you can get a big group to blow and clap their hands for the later portions of the story. That’s pretty good. I imagine a picture book app for this book with something approaching mild horror. This is odd, particularly when you consider the debt this book owes to the mindset that accompanies that technology. Yet to make this into an app would render this book . . . ordinary. No different from any of the other downloadable games out there and, indeed, much less impressive. What sets Press Here apart from the pack is the fact that it is printed on paper. There’s a magic to the book that is akin to the magic of pop-up books. In paper there is power and Press Here taps into that. It is, I hope, the start of great new things to come with one of the oldest formats on earth. I was pressed to read this book. Ha! I wasn’t expecting to like it but I ended up loving it. It’s very clever. I like that children’s/readers’ actions “write the book” and that it’s an enjoyable activity, and that it helps young kids with fine motor skills, and counting skills and with learning colors, and directions (left, right, up, down). As readers follow the directions, it will seem to them that they are creating what’s on the next page. What a great idea! This is a very entertaining, intera I was pressed to read this book. Ha! I wasn’t expecting to like it but I ended up loving it. This is a very entertaining, interactive book, and at the end kids are invited to read again, and will likely want to read (play) again. I’m an adult and even I thought the reading experience was fun. Interesting concept. Instructions about what to do with a coloured button, which will make something exciting happen and flow onto the next page. Not just reading, but acting and following instruction. Shake the book, shake it harder. What will happen? Indy thought this was fun. Need more time to read stories in a calm environment when we have time for reading and relaxation. It's hard to do after a long day at pre school. We will read this again. Good thing I work in a library = long loan. Nothing special for a kid to learn. A dot is such a simple thing. A simple thing that turns into something magically fun in this marvelous new book by Hervé Tullet. Tullet combines simple, colorful dots with simple, clear directions for a book bound to lead to interactive fun. 1. Its size. It is square (8-3/4" x 8-3/4"). 2. Its cover. Its cover is made of good stiff cardboard of the sort used to make board books. 3. Its pages. They A dot is such a simple thing. 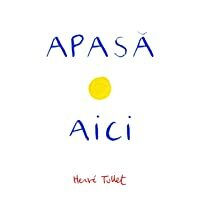 A simple thing that turns into something magically fun in this marvelous new book by Hervé Tullet. 3. Its pages. They are not board-book pages, but they are a thick, heavy, glossy paper that feels sturdy enough to stand up to toddlers - the target market for this book. 4. Its text. It's not poetic or in any way convoluted; it's a series of simple instructions, with a bit of commentary. E.g., "READY?" (and on the next page) "PRESS HERE AND TURN THE PAGE." 5. Its suitableness for its target age range. This is a book that is targeted for kids who are learning how to follow directions. They are learning their manners and how to put their clothes on and how to line up for things at nursery school and such, and this book is (pardon the pun) spot on for them. 6. Its whimsy. The directions on one page "tilt the page to the left . . . just to see what happens"; the image on the next page shows the dots have bunched themselves up along the left edge of the page. Tullet never claims that there's anything magical going on, yet through the playfulness of the text (and the interaction of the reader), it feels like there's a little something magical happening. I was pressing, rubbing, shaking and clapping along as I read the book, which I finished with a huge smile on my face - and I'm almost 47, yo, so just imagine how much more fun this book is for an actual child. Highly recommended for anyone with someone in the 2-7 age range around who wants to have some fun. My thanks to the good folks at Chronicle Books for sending a review copy my way. Very nice present from cousins! Unfortunately, the page where all of the dots fall to one side made us very sad for some reason. We'll come back to this one. Press Here is magical—and a delight for any age. 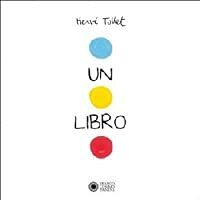 The daughter, who is not only a very cool tween, but a TAG reader of books well-above her age, was seen the other day on the floor of the Library with Hervé Tullet’s Press Here, a rather simple looking pre-school interactive book—at least, that is what I thought when I saw it. We were at the “Lucky Day” shelves of the Juvenile Section. I figured the book had been mistakenly shelved. It may have been, but Natalya was pressing and shaking and blowin Press Here is magical—and a delight for any age. 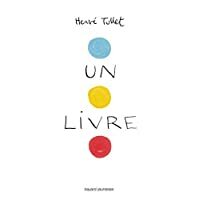 The daughter, who is not only a very cool tween, but a TAG reader of books well-above her age, was seen the other day on the floor of the Library with Hervé Tullet’s Press Here, a rather simple looking pre-school interactive book—at least, that is what I thought when I saw it. We were at the “Lucky Day” shelves of the Juvenile Section. I figured the book had been mistakenly shelved. It may have been, but Natalya was pressing and shaking and blowing across the pages. She insisted I take a turn with the book. And when we got it home, we insisted Sean take his turn as well. The anticipation builds as you progress through the book and are asked to “tilt the page” this way and that, or clap so many times, or try to press on all the yellow dots that are spread out across the two pages. * What wonderfully whimsical thing will occur next? Even on the second or third pass through the book, or even experiencing the book with another, there is a smile, a delighted laugh ready. Press Here is a book you should not miss out on, regardless of age, or perhaps, especially because of your age. *on the last image (which is 3/4s the double-page) it was fun to watch the solution the person came up with to carry out the instruction. In a video I saw, the children pressed the yellow dots in succession. I spread out all my fingers to push them at the same time, Sean and Natalya used an arm. noted: “Tullet’s brilliant creation proves that books need not lose out to electronic wizardry; his colorful dots perform every bit as engagingly as any on the screen of an iPad.” Publishers Weekly (April) which is something to get excited about. Over time, I’ve prattled on and on about the elements that make for quality kids’ books. Memorable characters, beautiful artwork, compelling plot, and so on and so forth. Today, let’s get more basic than that. What about a book you can hand to almost any kid and it would make them smile? What about a book that will provide some of the most eager page turns you’ve ever seen? 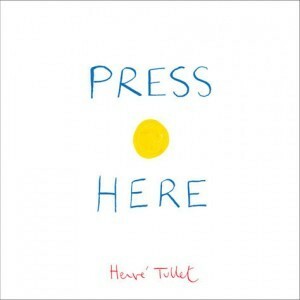 Press Here, from the wildly creative French author/illustrator Hervé Tullet, has that ability. Simple in appearance, genius Over time, I’ve prattled on and on about the elements that make for quality kids’ books. Memorable characters, beautiful artwork, compelling plot, and so on and so forth. Today, let’s get more basic than that. What about a book you can hand to almost any kid and it would make them smile? What about a book that will provide some of the most eager page turns you’ve ever seen? 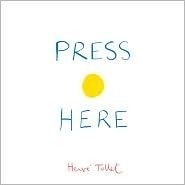 Press Here, from the wildly creative French author/illustrator Hervé Tullet, has that ability. Simple in appearance, genius in execution. Sure to go down as one of my favorite picture books of 2011. I would contend that Press Here is actually more interactive than many digital picture books. Touching, rubbing, shaking, blowing, tilting – can you name an app that registers all those different actions? The design of the book is also memorable. Press Here arrives Sans jacket and sporting old school Golden Books-esque raw cover edges that leave (gasp!) exposed gray cardboard. The page stock is thick, helping in the wear and tear department. خیلی خوب بود. مجید خدابخش یکی از دوستانم بهم معرفیاش کرد. انتشارات دیبایه از آن نشرهای کودک گزیده کاریست که هر کتابش تجربهایست برای خودش. کتاب تعاملی است. یعنی از بچه میخواهد کاری بکند و پیش برود. مثلا کتاب را تکان بدهد و بعد ورق بزند ببیند دایرههایی که توی صفحهی قبل دیده چطور بهم ریخته است. یا مثلا دست بزند و محکمتر دست بزند و باز هم محکمتر دست بزند تا دایرههای با هربار دست زدن و ورق زدن بزرگتر بشوند. اینکه نوینسدهای با چنین ایدهی سادهای و فقط با استفاده از چند دایرهی رنگی و نقاشی بسیار ساده بتوا خیلی خوب بود. مجید خدابخش یکی از دوستانم بهم معرفی‌اش کرد. انتشارات دیبایه از آن نشرهای کودک گزیده کاری‌ست که هر کتابش تجربه‌ایست برای خودش. کتاب تعاملی است. یعنی از بچه می‌خواهد کاری بکند و پیش برود. مثلا کتاب را تکان بدهد و بعد ورق بزند ببیند دایره‌هایی که توی صفحه‌ی قبل دیده چطور بهم ریخته است. یا مثلا دست بزند و محکم‌تر دست بزند و باز هم محکم‌تر دست بزند تا دایره‌های با هربار دست زدن و ورق زدن بزرگ‌تر بشوند. این‌که نوینسده‌ای با چنین ایده‌ی ساده‌ای و فقط با استفاده از چند دایره‌ی رنگی و نقاشی بسیار ساده بتواند فضایی اینقدر دل‌چسب برای بچه‌هایی که دارند کتاب را می‌خوانند درست کند حسادت آدم را غلغلک می‌دهد! Забавна интерактивна книга (такава, която ти дава команди и на всяка нова страница се случва промяна, вследствие от изпълнението им - натисни, разклати, духни...). През лятото четох една доста по-веселяшка с дърво и листа. Не са точно моето нещо този тип книги, но се радвам, че вече си имаме и такива, благодарение на издателство Funky Books. С любопитство бих я почел с племенника си. (Замяната на ръкописно изписване (както е на оригиналната корица) с гаден шрифт, който се прави на ръкописен, вина Забавна интерактивна книга (такава, която ти дава команди и на всяка нова страница се случва промяна, вследствие от изпълнението им - натисни, разклати, духни...). През лятото четох една доста по-веселяшка с дърво и листа. Не са точно моето нещо този тип книги, но се радвам, че вече си имаме и такива, благодарение на издателство Funky Books. С любопитство бих я почел с племенника си. I liked: everything about this incredibly creative book! she liked: the ipad-like quality of changing pictures on real paper. Brilliant 'interactive' book for little ones. Simple dots provide the pictures: follow the instructions on each page to make the magic happen. A big hit with L (2 and a half) who particularly loves blowing the dots off the page (luckily the pages are fairly think so any 'spray' caused by enthusiastic blowing is easily removed!) Could provide inspiration for older children to make their own interactive book. Super fun book! The librarian at my school read it to my Grade 5 students a few years back. They loved it. My nearly 4-year old son loves it too. Recomand părinților cu copii care descoperă acum formele, culorile, stările. Veți fi încântați! Micuțul la fel. Brilliantly simple, this interactive book is very simple. The illustrations are pretty much circles in primary colors. But the beauty is that each page has simple instructions such as "stand the book straight up" with the next page containing a reasonable result of such action, in this case all the circles laying on the bottom of the next page. I wish I'd known about this book when my nephew was just a little younger and would have been amazed. It was on the new shelf when I dropped books off at the library yesterday, so I grabbed it. Later, after supper, I found Tosh rooting through my library bag to see what I'd brought home. We "read" it together. We are by no means babies, and we were both mighty amused. Delightful. Picture books that offer insight into perspective and point of view appeal to me as I've always had a slightly skewed way of seeing the world. "Press Here" is another book about the power of imagination and creativity. This is like the cutest book ever. I randomly saw this on a shelf next to the YA books at B&N and read it with my younger sister. It's a great book for kids. Place la 2 ani și 7 luni. Zgâlțâie, suflă, bate de 5 ori, freacă bulina. What a great interactive board book for children and adults! I can assure you that anyone of ANY age will enjoy this playful book about dots! The book sounds very fun. I think it helps to learn how to count or numbers in very fun way. The most fun part is dots are bigger and bigger when readers clapping. 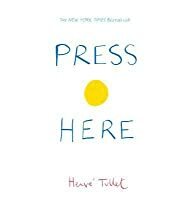 "Press Here" is an interactive, non-fiction children's picture book, intended for ages 2 and older. It won in the "best children's book of the year" category for Kirkus Reviews, Publishers Weekly, Amazon.com, and was the ALA Notable Children's Book of 2012. The narrative requires participation from young readers, as one yellow dot becomes two (by pressing on it) and then turns different colors, and so on and so forth. There is some tilting and shaking involved, and eventually blowing and clappin "Press Here" is an interactive, non-fiction children's picture book, intended for ages 2 and older. It won in the "best children's book of the year" category for Kirkus Reviews, Publishers Weekly, Amazon.com, and was the ALA Notable Children's Book of 2012. The narrative requires participation from young readers, as one yellow dot becomes two (by pressing on it) and then turns different colors, and so on and so forth. There is some tilting and shaking involved, and eventually blowing and clapping as well. It is difficult to find a great interactive children's book, perhaps because not many authors and illustrators venture out to make them. What makes this a home-run for kids, is the brilliant concept, and the great execution of that concept. I can see this concept working with several different other approaches as well, such as shapes and animals and sounds. Pre-schoolers especially seem to enjoy this; children will want you to read it over and over even though they know what's coming on the next page. At this young age, they still believe their fingers and clapping and blowing is causing an effect on the dots. Beyond kindergarten, though, it loses its excitement, as kids know it's always the same story. 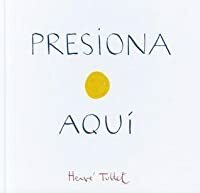 Hervé Tullet is the creator of more than fifty children’s books, including Press Here, which has been translated into twenty-seven languages. He loves to provoke surprise with his books, as well as in the dynamic workshops that he takes part in. He lives in Paris and is celebrated internationally for his playful, inventive, and interactive storytelling.